a nice twist to a traditional dish…just in time for Thanksgiving too! -Cut the acorn squah in half (horizontally). -Then scoop out the seeds as you would a pumpkin. 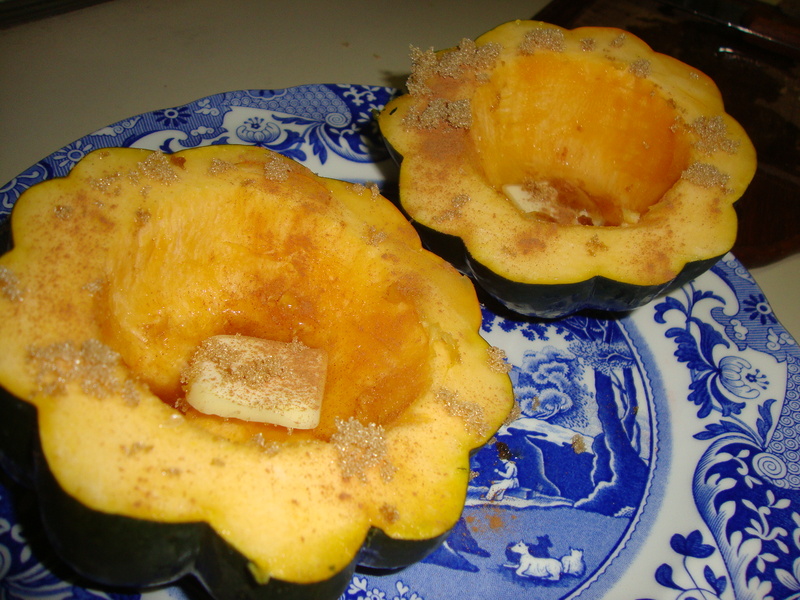 Try to flatten each half by cutting with a knife so the squash can lay flat on a plate. If you can’t cut the stem its ok, it will cook fine off balance as well. -Lay both halves (middle end up) on a microsafe dish with a tiny bit of water in the hole, just an eighth of an inch or so. Add a dab of butter, a few pinches of brown sugar, and a shake of cinnamon. -Cover it with saran wrap and cook for 10 minutes in the microwave. Carefully remove plastic and watch out for steam. Eat with a fork, enjoy! I believe you could add the brown sugar, cinnamon and butter right before eating as well.